There's a saying when looking at old houses (or old faces, I suppose), that they have “good bones,” meaning that they are built with quality and character. While people may slather on their own misguided style over the top, the bones stay the same, waiting for just the right person to come along and allow them to shine. Many of us are familiar with the excellent work done with Nobuo Uematsu's Final Fantasy lexicon, yet it may surprise you to know that there are, in fact, other great lo-bit producers out there who worked on systems other than (gasp!) the reverential Nintendo Entertainment System. Guys like Chris Hülsbeck and the Commodore 64. While it is becoming more common to see video game music performed live with an orchestra, it's not often that the end result amounts to anything more than a passing curiosity. It's nice to pretend that all retro game music is somehow glorious and profound simply because it's retro and therefore oh-so cool, but the fact is that there's a massive pile of dreck covering up the few gems underneath. The fact that hvsc.c64.org alone has a collection of over 30,000 C64 SID songs is testament enough to that. How does one manage to wade through this seemingly insurmountable ocean of material? Well, one good way is to follow whatever conductor Arnold “Arnie” Roth is involved with. 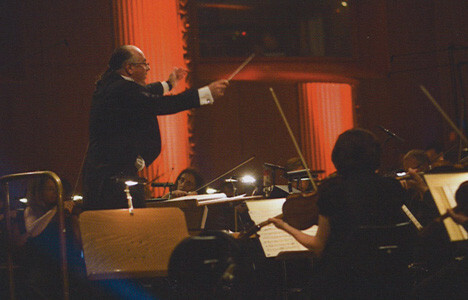 He's the man behind the baton on two of the best orchestrated Final Fantasy performances released, both Distant Worlds and Dear Friends, as well as PLAY! 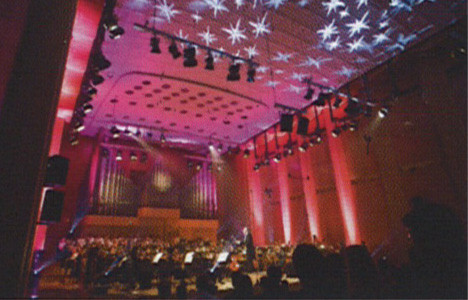 A Video Game Symphony. 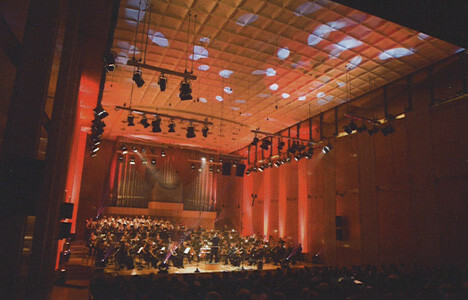 Along with arrangers Jonne Valtonen, Yuzo Koshiro (Ys, ActRaiser, and Etrian Odyssey), Takenoubo Mitsuyoshi (Shenmue, Virtua Fighter, and Daytona) and Adam Klemens (Immortal 3), Roth and the WDR Radio Orchestra, FILMharmonic Choir Prague attempted to bring the magic to Hülsbeck's musical history (including Amiga, PC Engine, film scores and the aforementioned C64) with two performances in Cologne. Thus, Symphonic Shades was born. With such good bones to work with and such talented musical architects involved, it would tough for anything to go wrong. Or would it? Hit that jump and find out. The show kicks off in a very loud and boisterous way with the opening fanfare on “Grand Monster Slam,” which has several echoes of various Star Wars themes. After a brief applause (something rare on this recording) “X-Out (Main Theme)” rolls in with a very ominous chorus and tremulous strings. It's a roiling storm moving over fields of battle. It's also absolutely stunning, almost awe inspiring, in fact. 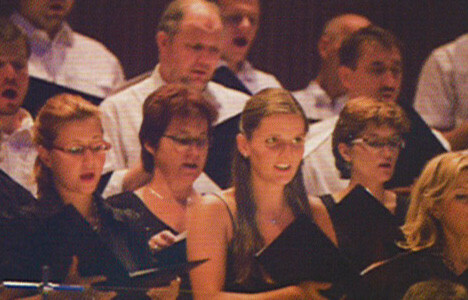 Relying very heavily on the large choir, it soars, rumbles and hisses (yes, they actually hiss!) with brash horns and thrumming basses propelling it along. This is easily the stand out track, right up there with Uematsu's orchestrated “One Winged Angel” and anything on the Lord of the Rings score. While it might seems like this has set up a “nowhere to go but down” situation, this isn't entirely true. “Jim Power in Mutant Planet” and “Tower of Babel” set up what I can only call the overarching “caravan” theme. Many of the songs on Shades have a feeling of a large caravan grandly traveling through exotic eastern lands, through India and Egypt and vast deserts. Grand and (again) boisterous seem to be the keywords here, with the timpani and other percussion in use much more often than your average musical score. The solo piano version of “Turrican 3 – Payment Day” is the first real break in the high intensity. It's the quiet and cool river oasis. It also marks a change in tone, with the following “Gem'X” being much lighter, with twinkling bells and, according to the included interview, ceramic cups! 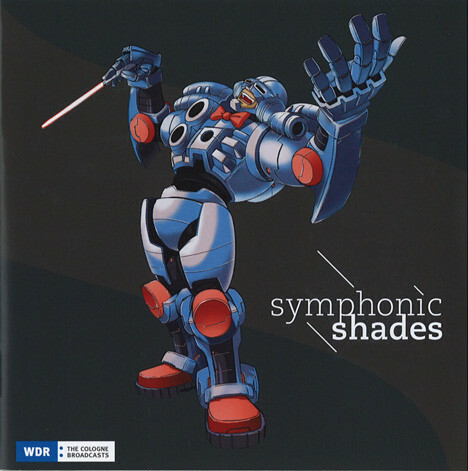 In fact, it might be a good time to mention that much of the arrangement on Shades features instruments not often head with such prominence in orchestrated form. The score is very visual, almost like it was meant for film. The songs seem to be telling stories, probably a result of their video game origins. Anyway, “Apidya,” with its original Japanese lyrics written by Mitsuyoshi, brings things back up to the previous grand level. “R-Type – Main Theme” keeps the energy high with a heavy emphasis on strings and horns. There's another quiet break with the melancholic “Licht Am Ende Des Tunnels,” the score to Thomas Böker's short film. “The Great Giana Sisters” starts off soft but soon breaks out into all sorts of different directions, from slightly swinging jazz to a more galloping Old West feel. If anyone was getting a little tired, this is the song that breaks up the monotony. Then, as if that isn't good enough, things really take a sharp turn with Rony Barrak's drum solo. We're not talking rock drums here, we're talking a crazy, lightning fast tabla/conga blitz. His solo runs for a few minutes before launching right into “Tunnel B1.” If the previous songs were a caravan through the desert, this is the entrance to a city of gold, full of ancient statues and bustling markets. While Barrak's drum work gets a little lost in the mix, it's still a tune that gets the blood pumping. An actual C64 emulator gets pulled out for the bass and melody on the title tack “Symphonic Shades,” an updated version of one of Hulsbeck's very first compositions. The inclusion of the sharp and wavering synth is just another cool addition to the already broad pallet of sounds. “Karawane Der Elefanten,” a song written just for the concert series, is the exotic city at night, full of mystery and magic and more than a little Indiana Jones-type danger. The final song “Turrican II - The Final Fight (Renderings: Main Theme)” feels a little crowded, full of too many ideas a little too loosely performed when compared to the rest of the album, but it does bring in a more strictly classical feel with an absolutely huge finish. It's safe to say that Symphonic Shades is a triumph. While its almost constant heavy style might turn off those with a love of things more soft and subtle, it will probably more than make up for it by winning over those how like things loud and thumping. It does ride out a rather eastern flair from beginning to end, something else that might not sit well with some, but again, it only adds to the originality of the album as a whole. That, coupled with a few surprises and the superb X-Out theme make this a must-have for fans of the orchestrated game music movement. You can find a ton of interviews with the people involved in the project here and both listen to and buy the album here.